If you require a vehicle that doesn’t limit when, where, and how you travel, the 2019 Land Rover Discovery performance deserves a closer look. This luxury SUV delivers 340 hp standard, tows over 8,000 pounds, and is available with industry leading off-road performance technologies. Tour the inventory at Land Rover Princeton, and find the right Discovery model for your lifestyle. Change gears in just 200 milliseconds and take advantage of a driving experience that is smooth and precise. This larger vehicle has a refined feeling thanks to the electronically-controlled transmission. Use a knob to steer your vehicle and trailer together when you're backing up. Navigating tight spaces or precise positions is easy when the vehicle does most of the work for you. Standard in all 2019 Land Rover Discovery configurations, you can travel down steep grades with complete control thanks to a feature the keeps your speed consistent and applies braking pressure to each wheel individually. Travel with enhanced confidence knowing this system is monitoring for driving issues like over- and under-steering and making subtle corrections to keep the vehicle under the driver's control. If you are less interested in raw power and more interested in traveling efficiently on your daily Edison drives, consider the available 3.0L turbo-diesel V6 Land Rover Discovery engine available. It offers 254 hp and 443 lb-ft of torque while achieving strong fuel economy estimates. No matter what engine is under the hood, the Discovery is sure-footed thanks to the standard Terrain Response system or available Terrain Response 2. Drivers simply turn a knob to re-tune performance based on the kind of terrain under the tires – mud, sand, gravel, snow, etc. You will love driving this luxury SUV around South Brunswick, but what is most exciting when you climb into the cabin is how many advanced and intuitive technologies it incorporates. This is truly driving taken to a higher level. Visit Land Rover Princeton for a complete tour and on-site financing. 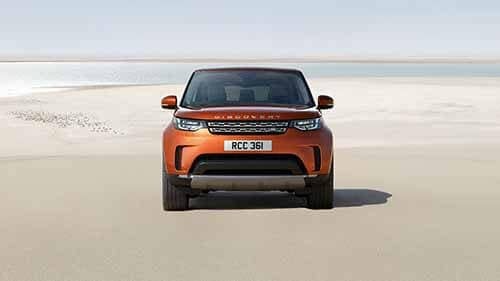 If you have any questions in advance of your arrival, don’t hesitate to contact us, or compare the Land Rover Discovery vs. Range Rover Velar to explore more options.